Zip lining can be a fun, thrilling adventure to experience either with a group or even by yourself. It’s a great way to get away from the stress of the world, and just become at peace with your mind, body, and with nature. So go on, take some time for yourself and go on an adventure, you may be surprised how much you enjoy this exciting experience. 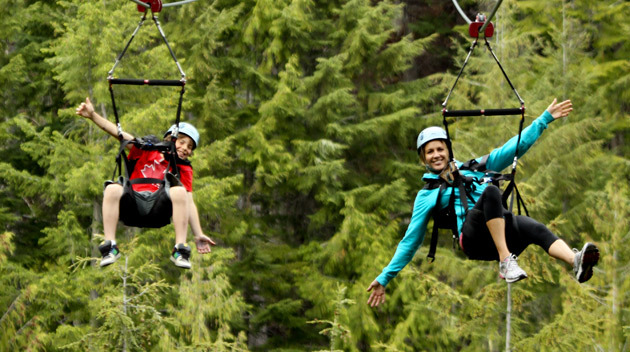 Zip lining health benefits are better than you’d ever even know! Improves eyesight – Zip lining is a great opportunity to strengthen your eyes and improve your long distance vision. As you fly through the sky, your eyes will be forced to switch focus quickly between the ropes near you and the stunning mountain views in the distance, which will train your eyes to focus quickly and will help make your vision sharper. Fresh air – Being outside and getting a good amount of fresh air is good for the lungs and for the soul. After being cooped inside all day, almost everyday, getting a literal breath of fresh air is exactly what your body needs. Wide open air cleanses toxins from your respiratory system, which in turn allows your body to function more efficiently, and protects it from sickness. A 2014 study by revealed that clean, pollution-free air significantly reduces instances of illness and death due to respiratory disease. Reduces stress – The best way to relieve some stress is by doing something new and exciting. Zip lining is such an absorbing experience that it is impossible to worry about any of your problems when you’re travelling full speed down the line. The scenery from so high up can be utterly breath-taking, and a zip lining adventure could truly change your life, as you are now seeing the world from a totally new perspective. Burns calories – When you spend the day zip lining you’ll lower your blood pressure and burn plenty of calories, all while having the time of your life! It’s usually quite a hike to get up the mountain to your peak destination, and this cardiovascular exercise helps to burn the fat right off of your body. Increases self-esteem – When you’ve completed your journey down the zip line, you feel a great sense of accomplishment, which boosts your self-esteem and makes you feel like you can do anything! For those who are afraid of heights or of falling, this adventure could allow you to conquer your fears and feel stronger than ever. Build stronger relationships – Zip lining is an exciting and emotional experience to share with your family or friends and you’ll be able to talk about it for a lifetime! You’ll never forget the moment you overcame your fears with your loved ones by your side, and this experience will only bring you closer together. Adrenaline rush – There’s nothing better to give you that huge adrenaline rush like traveling full speed down the zip line from dozens – even hundreds – of feet in the air. When you experience an adrenaline rush, your senses begin to feel heightened and may experience a sudden boost in energy, increase strength along with a decreased sensation of pain. It’s a thrilling feeling overall, and makes you more likely to push yourself into other activities outside of your comfort zone in the future. Sense of accomplishment – When you’ve finally gotten over all your fears and you’re soaring through the air, attached to a single zip line, you can’t help but become overcome with the feeling of accomplishment. You get a sense of pride for yourself after completing such a life changing experience, another thing to check off the bucket list. This rush will leave you hungry for more, and will encourage you to do scary, rewarding activities in the future. Peaks curiosity – There’s nothing like exploring the outdoors and experiencing the wonders of nature to help you open your mind and gain a sense of adventure. Enhancing your adventurous side will overall enhance other factors of your life by creating balance and excitement. Curiosity is necessary to do anything new in life, like beginning a healthy lifestyle or trying a new intensive workout. If you don’t push yourself now, you never will! Lowers blood pressure – The experience of zip lining is good for the heart. Not just metaphorically, but physically as well. While travelling through the trails to reach the zip line you are decreasing your blood pressure as you admire the scenery before you. Decreasing your blood pressure reduces the dangers of heart disease, diabetes, and stroke for those who are at high-risk. Interested in exploring the amazing health benefits of zip lining?